Do you ever feel like the fate of your blog is up to the Internet Gods?? If so, I can completely relate! After a year and a half of writing my blog I felt like I was moving at a snails pace and watching everyone around me take off running! The Facebook algorithm is complex and confusing. If you are posting wrong on your page your reach is super low. Staci’s book showed me how to leverage what I was posting, where and when, for maximum results. In particular her information about groups has been super helpful! These strategies really work. Facebook was especially hard for me. I felt like I was dependent on bigger blogs to get my work out there. If you’re like me you didn’t decide to be a blogger to have to depend on others. At one point I got so fed up with it that I actually quit using it for about 3 months. Sounds horrible right?? Actually it wasn’t. 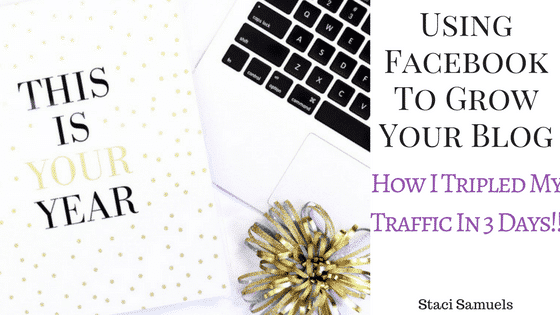 My break from Facebook gave me time to evaluate how using Facebook to grow your blog could actually happen! Share is caring! Pin me for others! When that eureka moment finally came to me, I went from 1,100 followers on Facebook to 1,800 in a week! Before that I was gaining about 10-15 followers a week. I also more than tripled my pages views in a matter of 1 DAY! The strategies taught in this course took me from about 1,500 page views a day to 6,000 and growing!! On top of this course all about using Facebook to grow your blog you will also receive a spreadsheet to track your Facebook activity and be welcome to join our exclusive Facebook group used to support each other in our blogging experiences! I hope to have you join us! I’m ready to help you in your blogging journey!